On the Palau de la Música façade in Barcelona you can admire this sculptoric group protruding out of the wall. I was just shooting randomly and back home I discovered this white trail behind a jet plane that funny enough seems to come out of the soldier's groin (my rotten mind!). The sculpture by Miquel Blay is larger and it is located on the corner of the building. The group is entitled La cançó popular catalana (popular Catalan song) and its main figure is a maid located right below. 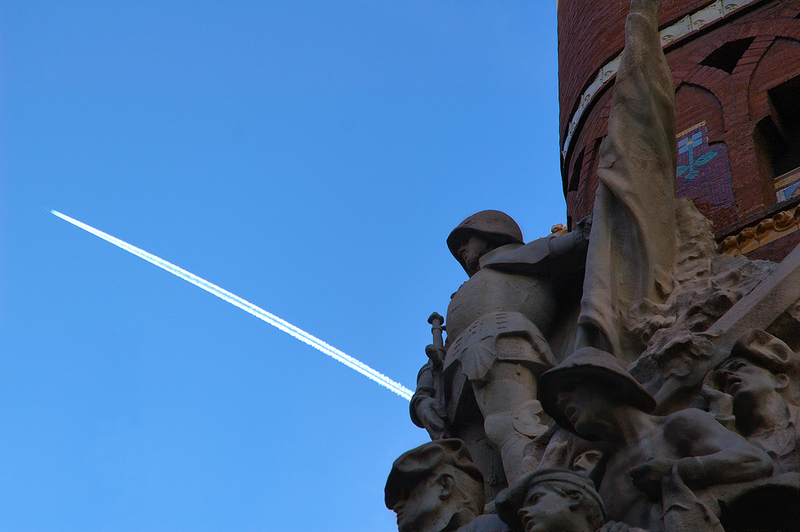 The soldier on top is a copy of a silver statuette of St. George in the Palau de la Generalitat chapel. Muy Bien Vista, muy original! wow... a great moment for a pic!! !